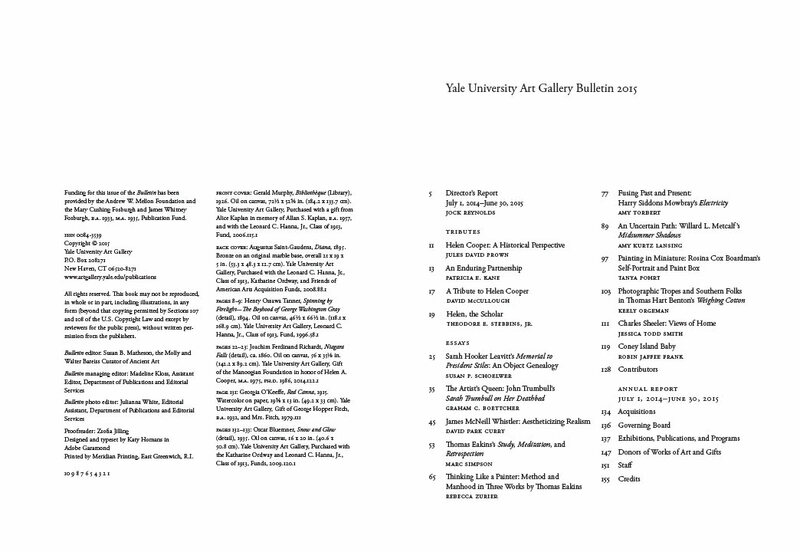 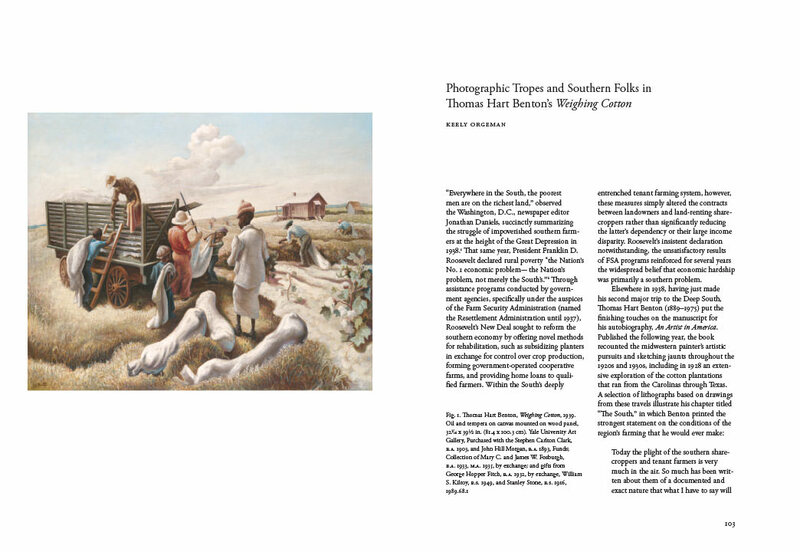 An annual compilation of themed essays, exhibition highlights, and Gallery news, the Yale University Art Gallery Bulletin publishes original scholarship on works in the Gallery’s collection. 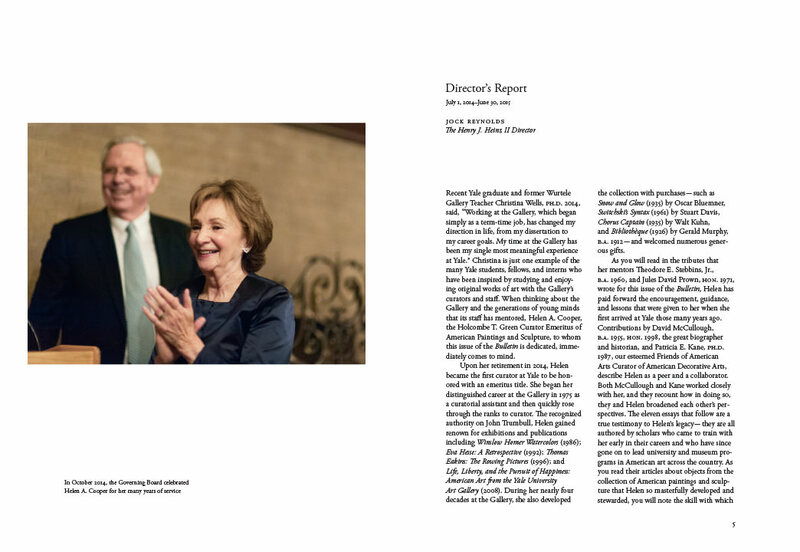 The 2015 Bulletin honors the distinguished career of Helen A. Cooper, the Holcombe T. Green Curator Emerita of American Paintings and Sculpture, who retired in May 2014 after nearly 40 years at the Gallery. 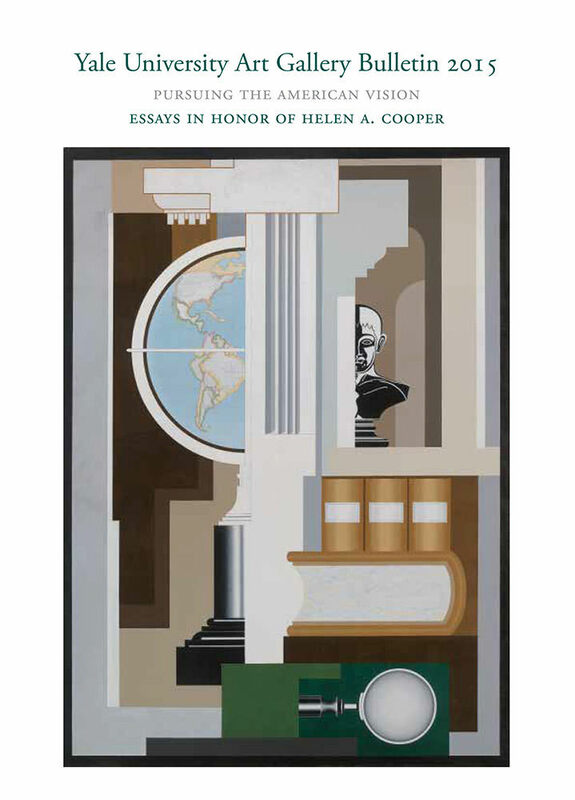 The remarkable scope of Cooper’s expertise, from colonial portraiture to modern American painting, helped form what is now considered one of the preeminent museum collections of American art in the country. 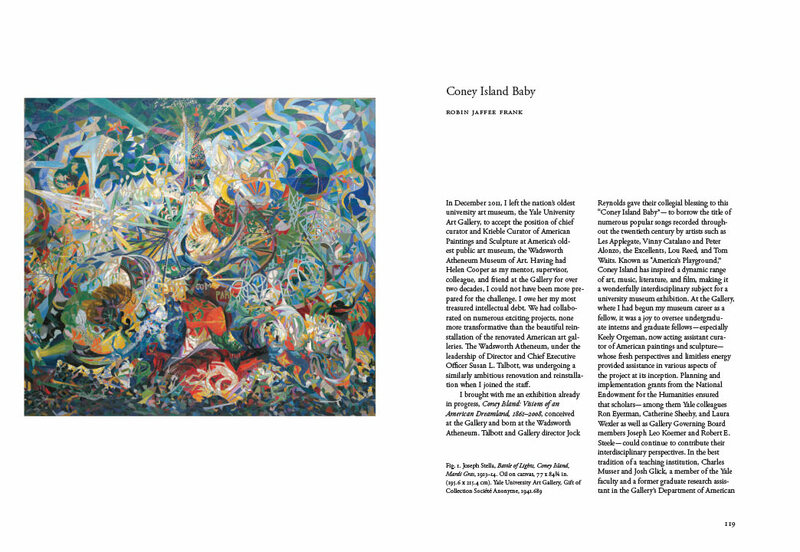 In addition to growing the collection in significant ways, Cooper organized several important exhibitions, including John Trumbull: The Hand and Spirit of a Painter (1982), Winslow Homer: Watercolors (1986), Childe Hassam: An Island Garden Revisited (1990), Eva Hesse: A Retrospective (1992), Thomas Eakins: The Rowing Pictures (1996), and Life Liberty, and the Pursuit of Happiness: American Art from the Yale University Art Gallery (2008). 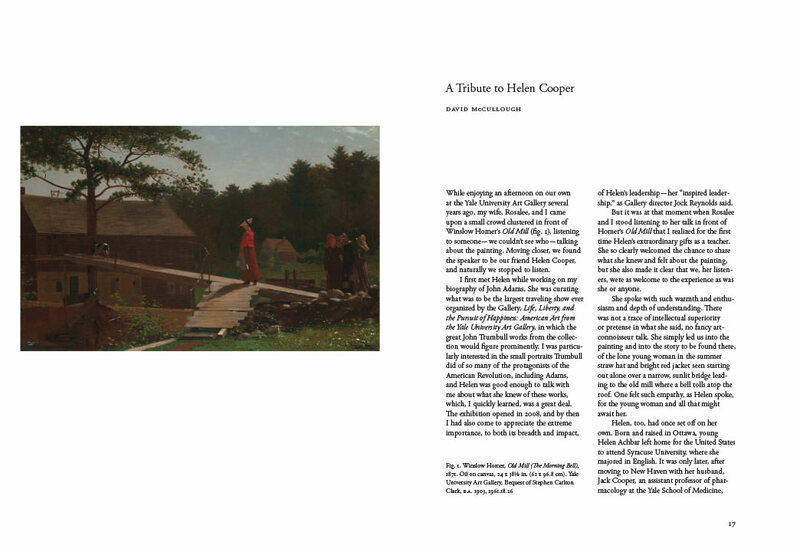 Fellow Gallery curators, former students and interns, and scholars of American art and history, including David McCullough and Jules David Prown, celebrate Cooper’s career in this volume. 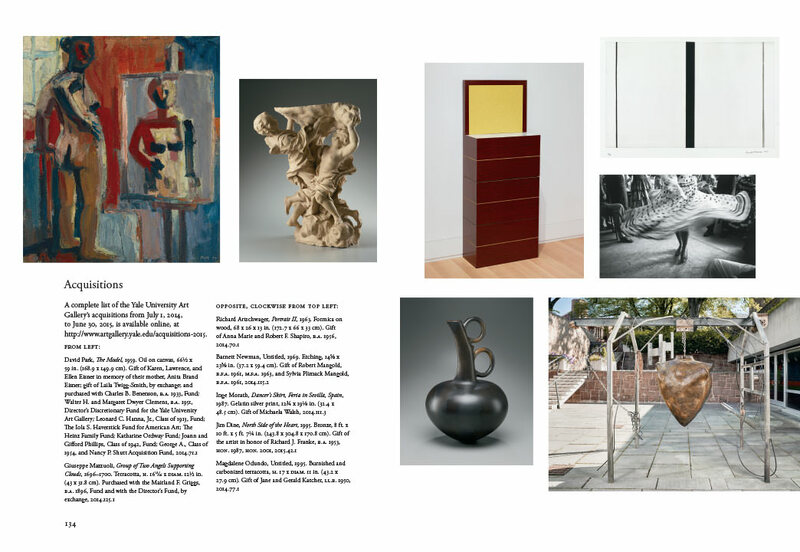 View this year’s acquisitions here.